The tachi sword is a traditionally crafted Japanese sword dating back to the Kotō period (900-1596), a design that preceded the katana. This samurai sword was worn on the belt with the cutting edge down as opposed to the katana and it was most effective when used by cavalry. The mei, or signature, appeared on the side of the tang that would face outward when worn on the belt. Our tachi swords are made from the highest quality materials, such as 1060 and 1095 high carbon steel, and are handcrafted with intricate detail and care. Fully functional for multiple applications, the Japanese tachi sword is perfect for iaido and kenjutsu, gifts, cutting practice, or to be added proudly to your collection. Need something more to complement your tachi sword? Check out our sword accessories or our selection of Japanese knives. 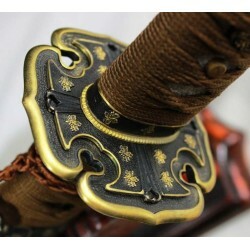 This tachi sword is made of 1095 high carbon steel, clay tempered with a polished mirror-like s.. The blade of this tachi is made of high grade Damascus folded steel. The steel is folded 14 tim.. This tachi sword is made of 1095 high carbon steel, clay tempered & folded with a polished ..